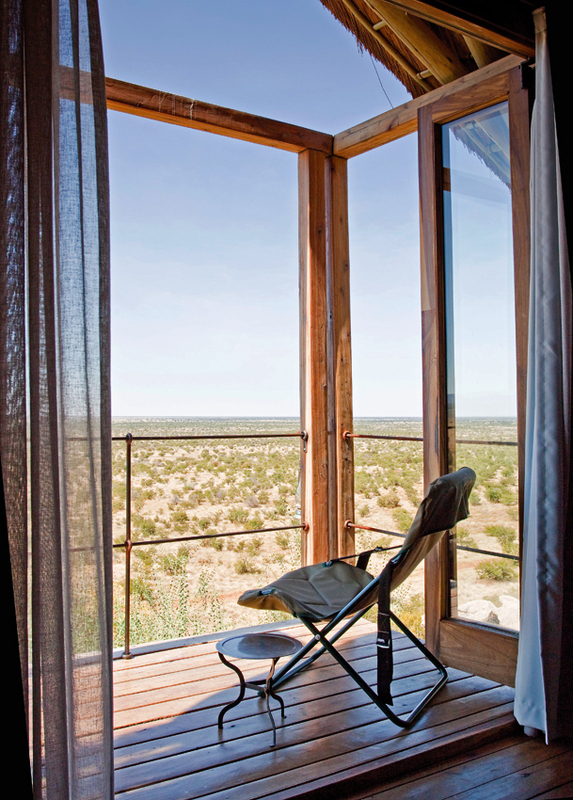 While reclining in my canvas deckchair, listening to the whinnying zebra kicking up dust clouds far below, I can hardly believe that I’m actually in the Etosha National Park in Namibia. 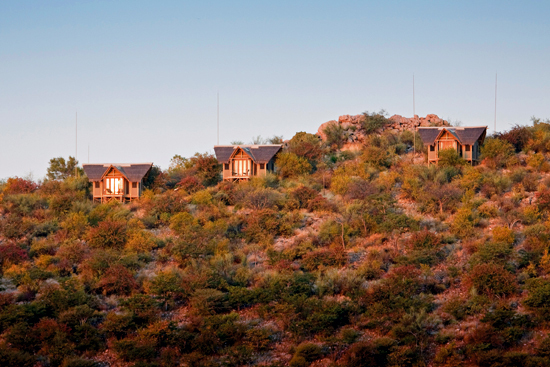 Those traditional bungalows of the Etosha we know and love so well are far away from here, literally and figuratively. This little deck is just large enough to hold two chairs. They recline at exactly the right angle, and have just enough room in between for a little table on which to rest your glass of iced Sauvignon Blanc. We have a chalet – or is it a tent? – on the eastern slope of the koppie, well below the road that accesses the chalets. Motorised golf carts transport guests up and down the track between their chalets and the car park, thus keeping the disturbance down. So it’s quiet and very private here ‘over the edge’. You can simply lose track of time, suspended above these magnificent plains. While lying in my chair in a half dozy state, I’m suddenly aware of a shadow floating overhead – it’s a lanner falcon just hanging on the wind. For a brief moment I’m part of its world on this warm, late autumn afternoon as we watch for small prey fluttering in the bushes below the deck. I see now what the falcon is watching – a bevy of busy red-billed queleas darting furtively around under a bush in front of me. They’re drinking water from an overflow pipe and the entire tree is quivering with little birds. The falcon does a few fly-bys before she decides it’s not worth the effort. Just this morning, from their chalet deck, our Swedish neighbours were photographing lions at the nearby waterhole. When checking their photographs they found a leopard in the foreground stretched out on a rock, also surveying the scene. The camp is not fenced and this, needless to say, adds to the charm and excitement of Dolomite. After dinner at night a staff member accompanies you to your chalet, since you may not walk alone after dark. Then you can sit out on the deck again and watch the moon moving up and eventually over you. It’s almost too beautiful to move indoors, but the soft beds will eventually beckon. 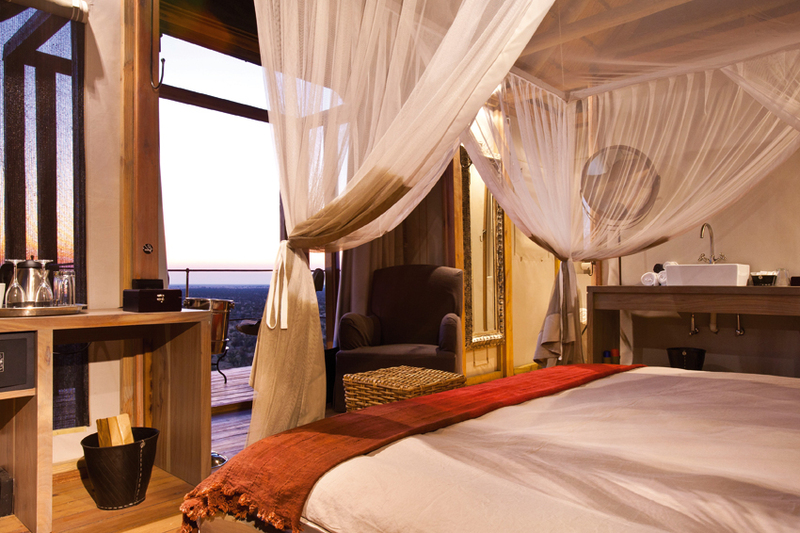 Mosquito nets mean you can leave the doors flung wide open to fully embrace the fresh air and listen to night sounds – if you can stay awake long enough, that is. Meals are served in canvas dining rooms, with friendly, attentive and informed staff making the entire experience a treat. 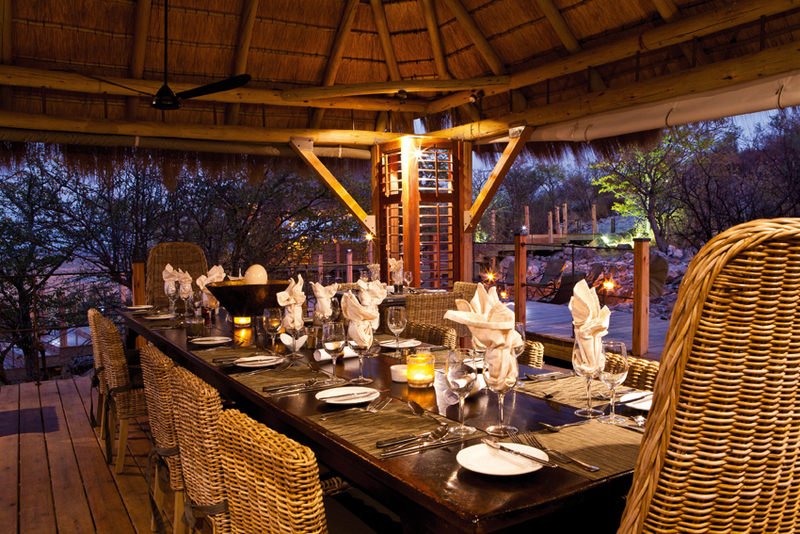 You can spend some time at the fireside in the boma after dinner and chat with fellow guests about the day’s sightings. The lions definitely seemed to be the highlight for those who saw them, but we held the trump card for that day. On entering the park at Galton Gate early that morning we happened on three cheetahs at the roadside. For about half an hour, with no other vehicles driving past, we watched them drinking water in a rock pool just off the road. What a wonderful start to our first visit to the western side of Etosha. On the way to camp this treat was followed by another private sighting of a leopard cub. We continued to see lots of game at the waterholes, especially at Renostervlei where a black rhino put in a guest appearance. The waterholes are all well worth visiting and make for good photography, as they are mostly on the open plains. 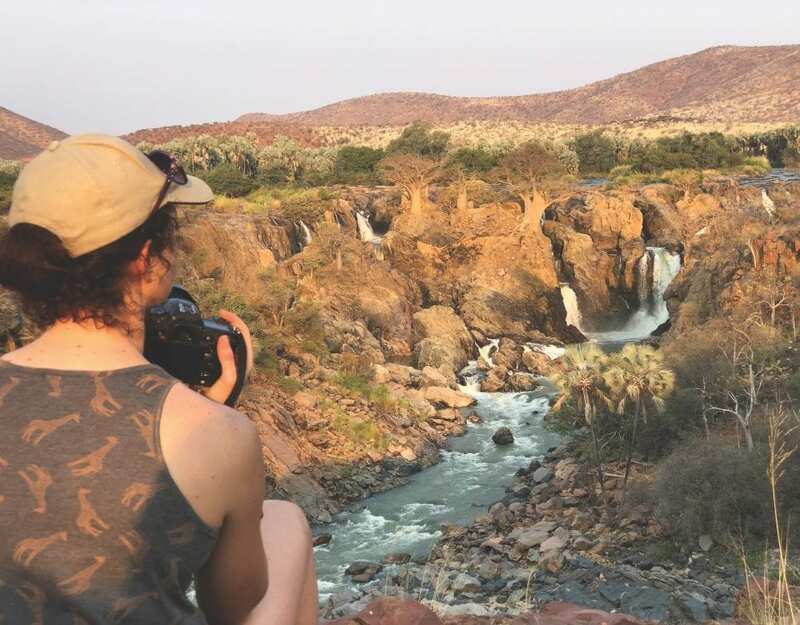 The scenery is definitely rather different to that of the Etosha in the central and eastern sections of the park. 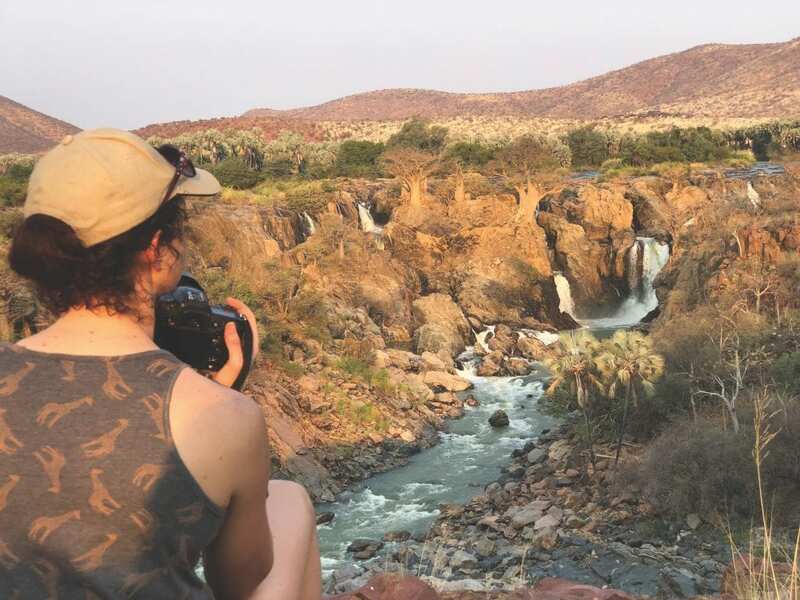 I’m already looking forward to our next visit to spend time at more waterholes and venture on routes that we didn’t take this time round. But then, of course, it’s equally enticing to lounge around on your private deck – just don’t forget the Sauvignon Blanc and some snacks, because it’s a long way down to the fridge in your vehicle! This article was first published in the Travel News Namibia Autumn 2013 print edition.